I've been on our Community Counter Terror Team for a long time. The team is under the auspices of the IDF with local municipal cooperation. Since the IDF can't be everywhere, we act as the first line of defense if there is a terror threat to our community. We are issued IDF M16 or M4 rifles, and are tasked with carrying them around the neighborhood and take care of business in the event of a terror attack. In addition, we carry our personal handguns. Mine is a Glock, which is the most popular of the brands on our team. We train in Hostage Rescue, Urban Warfare, Krav Maga and many other techniques and tactics. Other then our rifles, our gear consists of whatever we can get our hands on (there is no budget). Over the years, we managed to scrape together enough funds to purchase the highest quality ceramic vests, Kevlar helmets, etc. Rifle accessories are expensive so we tend to scrounge them from various sources including newly released IDF Servicemen. There are lots of different accessories in use by our team from lots of different sources. I've tried out just about everything and found some accessories to be high quality and others to be junk. I've recently taken on the responsibility of evaluating new equipment for our team. I've used fore grips in the past, some that even fold. Usually they are wobbly, not ergonomic and a pain to fold and unfold. 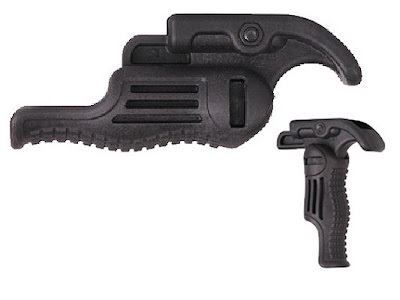 The FAB Defense FGGS Tactical Folding Grip is amazing. It mounts tightly to the Picatinny rail, it's ergonomic and feels natural when folded and unfolded and is knurled (so sweaty fingers can still grip it without slipping). It locks tightly when open (the others I've tried don't). Open- Short range it adds stability to the rifle which is a must when shooting rapidly at moving targets. Closed- Long range it provides a comfortable place to support the rifle when taking careful aim while not gripping the rifle tightly, think sharpshooter. The FGG-S Grip Carries FAB Lifetime Replacement Guarantee! It also mounts to the rails on most handguns and is perfect fit for the Glock. 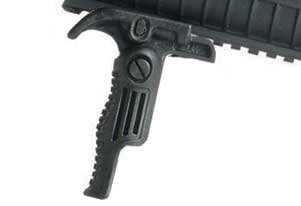 If you own a rifle, do yourself a favor and get the Fab Defense FGGS Tactical Folding Grip!